Yesterday, a couple of upcoming Motorola phones cleared FCC with the model numbers XT1922-4 & XT1922-5, and it is expected that these are the Moto E5 and E5 Plus that are coming this year as the successors of last year’s Moto E4 and E4 Plus. 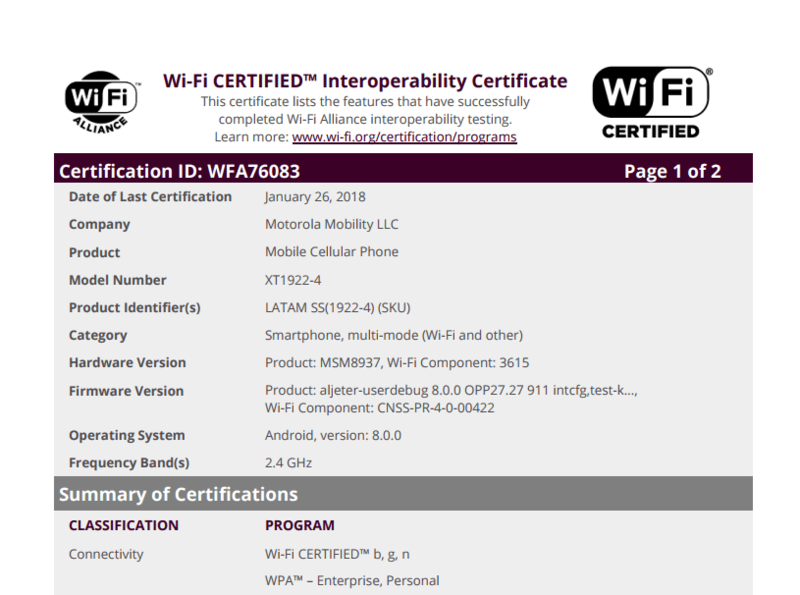 Today, the Motorola XT1922-4 got certified by the WiFi Alliance which again confirmed its existence and also gave a hint that these phones are coming soon. Along with this, the certification also revealed a couple of specifications like Android version and the processor. So, supposing it to be the Motorola Moto E5, the phone is coming with Android Oreo 8.0.0 out of the box, and it is powered by the Snapdragon 430 processor which is a good chipset for the low-end devices. The FCC listing revealed a 4,000mAh battery, so it seems this phone is going to be solid in the battery department. So, it looks like Motorola is going to use Snapdragon chipsets for its E-series phones since we saw last year’s Moto E4 and the Moto E4 Plus with MediaTek processors. If the Motorola XT1922-4 is the Moto E5, then it could be a decent budget smartphone of this year. We have already seen the design, thanks to the press render that leaked this month and there is no 18:9 display on the phone and it looks like a typical Motorola phone with bezels all over the front. It will be interesting to see the price tag for the phone since there are already a lot of amazing phones in the budget price segment from companies like Honor and Xiaomi.